Winemaking is rarely a solitary affair. Indeed, it is the rare exception when a winemaker claims sole credit (or responsibility) for the creation of a wine. Winemaking, in it's essence, is about family. 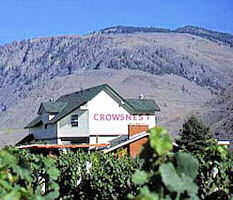 This is certainly true in the winemaking at Crowsnest Vineyards (also known as Barcello Canyon) in the Similkameen Valley (designated viticulture area), British Columbia. This vineyard was planted in 1995, in an area long known for it's quality fruit and vegetables since the 1920's. The Heinecke family bought said vineyard 3 years later in 1998 and have been growing it ever since. Originally from Germany, the Heinecke family certainly bring a strong German style to their winemaking with such cuvee as the Stahltank Chardonnay (Steeltank) which is a brilliant wine. The winery also boasts a year-round restaurant, little inn (auberge for the French audience) and even a bakery that has gluten-free products available! Ann Heinecke is the winemaker, trained at the Weinsberg Weins Schule and emigrated with her family to Canada in 1994. Ann's philosophy towards her wine, in her own words, is "To showcase the immense fruit and acidity balance that this valley has to offer... using only Similkameen valley fruit is out priority." palate: clean, off-dry, moderate+ (lemon and crabapple) acids, moderate+ to full body, moderate+ intense and youthful flavors of lemon grass, apricots, crabapples, light vanilla, gravelly terroir and minerality strong backbone, sweet-sour lemon and floral finish. Very good balance, good structure, moderate length. conclusion: This wine is drinking well now, and unfortunately, I don't believe it will develop at all or last more then a few more years. Please understand that I find this to be a competent wine in all respects, however for $20, in a global market, this is only decent value. I have, and will continue to, drunk this as it is something unique in it's flavor and aromas. For that reason alone, it is more then worth purchasing at least once. I compare this to a slightly sweet Kabinett Riesling, or an Auslese Riesling. PAIRINGS: This could certainly pair with mild white fishes, light cream sauces, etc... but when I started thinking a little German, it all made sense! Braised cabbage, speck or German bacon, some bratwurst and spicy mustard - this wine would sing! So some interesting things coming from the Similkameen Valley these days, and I for one couldn't be any happier. Two years ago, it seemed that no one really knew what or where it was, or believed that any decent wines were coming from there.